As leading experts of LA food tours (as we like to humbly consider ourselves), Lisa and I took our call very seriously to attend International Pow Wow 2012 (IPW 2012). This is the largest international travel conference held annually in the US, with over 6,000 attendees (“delegates” and press) from over 70 countries. The LA Convention Center housed the vast selection of destinations and attractions that America was showcasing to world travel representatives. What tremendous fun it was to be part of what LA has to offer! Lisa held court in the Pasadena booth with ladies from the Huntington Library and Pasadena Convention and Visitors Bureau to promote the very beautiful City of Roses, and our own Old Pasadena Walking Food Tour. Just across the way, I shared the Original LA Farmers Market booth with Matt Stayton, who is 5th generation “Gilmore” - the family that has owned the Market for the last 78 years, and its surrounding real estate for over 130 years. I was excited to turn wide-eyed visitors on to our Los Angeles Farmers Market/3rd Street tours. Sharing our “1200 block” in the exhibit hall were the LA Tourism and Convention Board, Starline Tours, The Getty Museum and Villa, and Santa Monica Visitors Bureau. Clearly we had some of the most dynamic and exciting attractions to share with those fascinated by southern California! It was our pure joy and pleasure to play a role in what Lisa calls “a plum opportunity for LA to show off as a world travel destination.” We had the privilege (and admittedly, some attached stress) of hosting delegates and journalists the weekend before IPW, on specially-created tasting tours of both the Original Farmers Market and Old Pasadena. Both tours were very warmly and enthusiastically received. Our own Kendall, Summer, and Barbara truly shone brightly as star tour hosts to help welcome and entertain these VIPs. On a national note, we were privy to a huge announcement from the US Travel Association (USTA) that for the first time in history, America will now be marketed worldwide as a travel destination. In addition to all of the daytime fun, chatting up that which makes our City of Angels so great, we also attended evening events which included a laughter-filled night at Universal Hollywood. We were the first to “experience” the new Transformers ride and we received badges to prove it. 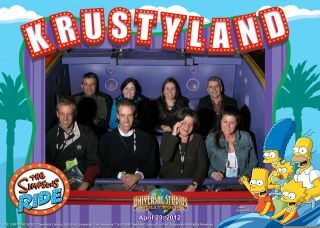 Lisa and I couldn’t resist a 10:30pm soiree with The Simpsons and, I’m afraid we’ve got the photo to prove that too. This is tough work that we do but we promise you, we are just the girls for the job!